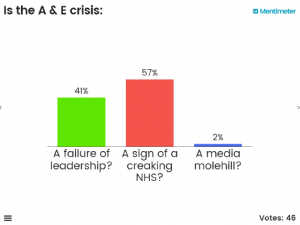 Earlier this year our Healthcare Professional Interest Network (PIN) at Imperial College Business School hosted an event titled “The A+E Crisis: Failure of Leadership, Media Molehill or symptom of creaking NHS”. Quite topical you might say, given that the A+E crisis is constantly in the news. We were privileged to have secured high caliber faculty for our event: Prof Cliff Mann (President of the Royal College of Emergency Medicine), Karl Munslow-Ong (Deputy CEO of Chelsea and Westminster Hospital) and Jeremy Taylor (CEO of National Voices). Each speaker put forward many fresh perspectives on the A+E crisis. You can listen to a full recording of our Healthcare PIN event and follow the speakers’ slides and discussion [The sound is a little soft in parts – I’d advise using earphones if you do]. To save you time, there is a summary of each speakers’ main points below… but first a bit of interactive blogging! How would you vote on these questions? A – a failure of leadership? 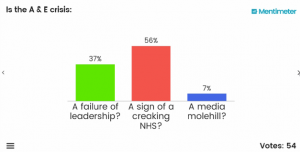 B – a sign of a creaking NHS? C – a media molehill? What is the biggest factor responsible for the challenges A+Es are facing? We asked our audience the same questions on the night, once before the session started and then a second time at the end of the session to see how the discussion might’ve influenced their thinking, if at all. 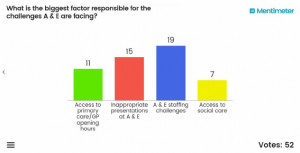 These at-seat polling, or ‘clicker questions’ as we like to call them, have become a regular feature at our Healthcare PIN events. Scroll down to see how your responses matched with those of our audience on the night. So, what influenced our audience? Cliff’s main thrust was to outline the crisis around staffing. Yet despite this shortage there was a 2.6% increase in productivity across A+Es (according to 2014 figures), which nationally is an increase equivalent to 6 average sized A+E departments. He presented shocking data around the number of consultants leaving the UK, and the extortionate locum costs that are being incurred (circa £3M a week nationally). No one has yet connected these dots that the money spent on locum consultants would more than double the number of consultants available tomorrow! He also dispelled the myth that patients generally present ‘inappropriately’ to A+E and that campaigns to stop them coming are questionable. His response to a question from the floor on barriers to innovation and leadership within the system was to say (and this is paraphrased), ‘barriers exist at the national level where the money side (Monitor) and the quality side (CQC) are not connected and clinicians, management and most importantly patients are stuck in the middle. Start by bringing these two things together and a major barrier to innovation and leadership would be overcome’. A thought provoking point he left us with was that A+E is the best known NHS ‘brand’; we should work with this and instead of it being a stand-alone service it should rather be seen as a hub around which other services sit. His final slide describes this vision. Chelsea and Westminster Hospital has consistently met the national A+E targets and it was a privilege to have Karl offer his perspective on ways to approach the national crisis. C&W recently took over West Middlesex Hospital and as such is in a privileged position of being able to compare the two sites with respect to the environment for patients and staff, the workforce and patient flows through the departments. The West Midd site is busier and less structured than the Chelsea site and Karl made a very complex issue seem simple. His focus was on the effect that good design and workforce can have on optimising the flow of patients through the system. He emphasized that a focus on the flow of patients both through the hospital and into a community setting, via good identification and triage, was a key factor in improving the experience and productivity of emergency services. C&W is making determined efforts to invest in more consultants and nurses, but Karl also drew attention to the use of technology in enabling better utilisation of scarce (workforce) resources. It’s a crisis of the system, not just A+E! Moreover, waiting targets are not meaningful and only serve to address internal needs and we should not obsess about them. 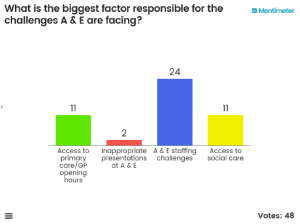 Jeremy called for a deeper understanding of the various drivers for why people go to A+E. 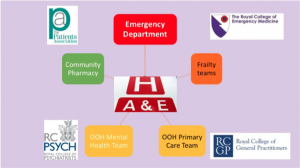 These range from simply being closer to A+E than any other facility, to not knowing about other services and even an observation that people from lower economic groups often find it cheaper to get to A+E than spend money on a phone call to 111 or other services. He agreed with Cliff that the population are not feckless and don’t use A+E stupidly. There is just nowhere else for them to go and if alternatives exist, they aren’t confident that the care they receive there is coordinated or any good. He noted that A+E is a victim of its own success – if it was a commercial endeavor we would laude it for the footfall it attracts. But it’s only a ‘failure’ because other parts of the system aren’t working and that in turn is a failure of leadership and politicians to develop coordinated out of hospital services that are fit for the 21st century. It’s time to design services around user needs! We need to build another offer, and brand it differently from A+E. Thank you for reading this post. I hope you found this useful. I’d be interested in any comments or discussion that it might have inspired. This has been ‘Away from the Heard’: The Saffron Steer blog.